As we head into the season of giving and receiving and joy and family it’s also a time for hilarity – at least at the Ward house. And, these days, the way we roll is to just let it go. I want to illustrate with science fair. There will be time for elves later. Those of you who know our family know that Davis and I are scientists by study, and certainly organized by nature, but it shocked even us to hear that the kids wanted to do science fair projects this year. All three of them. Even though all three aren’t required – below third grade – all three wanted to do it. Even though all three aren’t due until January 29th, they wanted to do it early. Sunday. And, even though there are only two parents, all three wanted a parent, all the time. 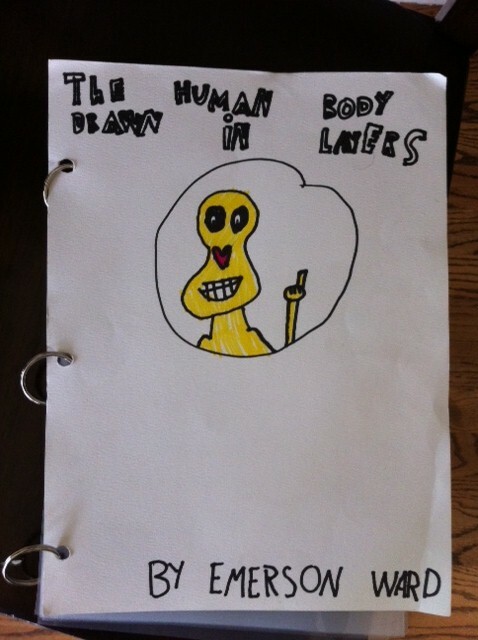 Emmy originally wasn’t going to do a project but then she thought about doing it, and thought about drawing a science book, and decided she should. 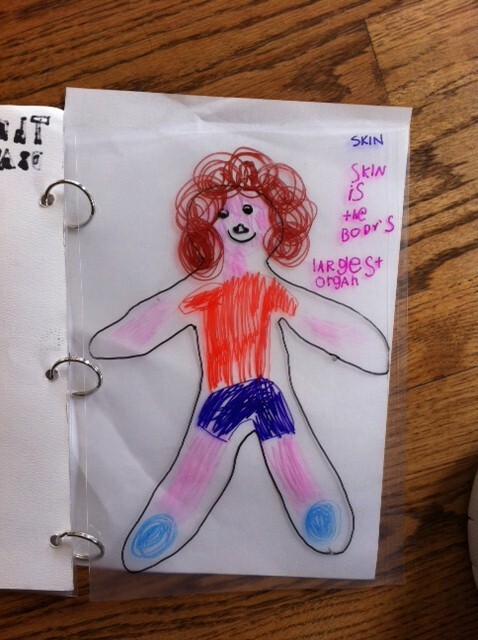 She has a book she loves that shows the layers of the human body and she wanted to make it. One of my gifts is execution – helping achieve a certain vision. 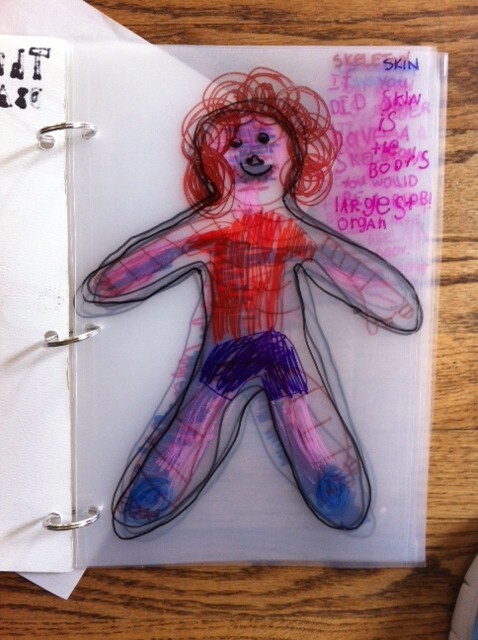 She had the vision – layers of plastic, held together with clips. 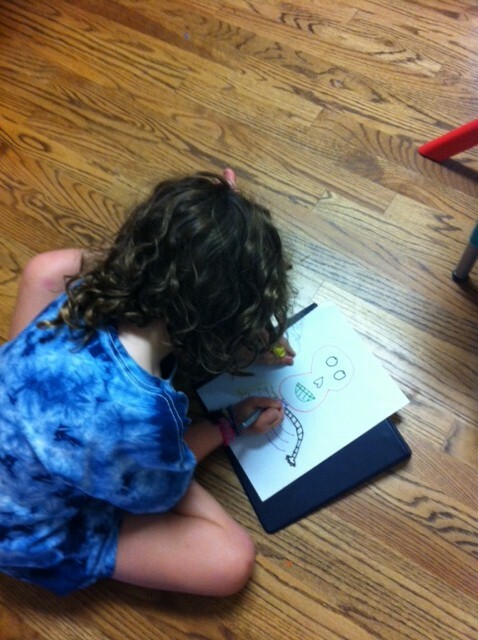 She brainstormed the layers: blood/heart, tummy, skeleton, brain, skin, lungs. We drew it and then she wanted to make a board. And we did and it has typed out facts she dictated to me and stuck on the board and it looks like a six year old made it and she did. Maybe it looks like an eight year old made it. It’s amazing. Did you know it takes 20 seconds for blood to circulate through your body once? Carter decided he needed to do something too – and they had just learned the planet song at school. SO, a model of the solar system. As we are in process on purchasing sytrofoam balls and a base and a board (2nd trip to Michaels if you’re counting) he says “And, Mom, the sun needs to light up.” Of course it does. I ask at Michaels – thinking I can get a lamp if I need it, but no, now they have LED lights that you can put into objects after you “turn them on” so Carter has a glowing sun solar system – each planet painted, in order, and a board with facts. Did you know that Pluto is in the Kuiper Belt? Had you even heard of the Kuiper Belth? 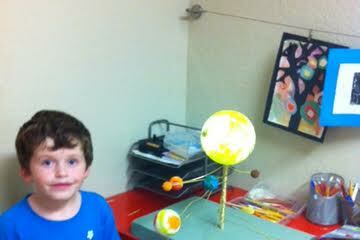 We weren’t able to complete Carter’s project Sunday because the planets had to dry. 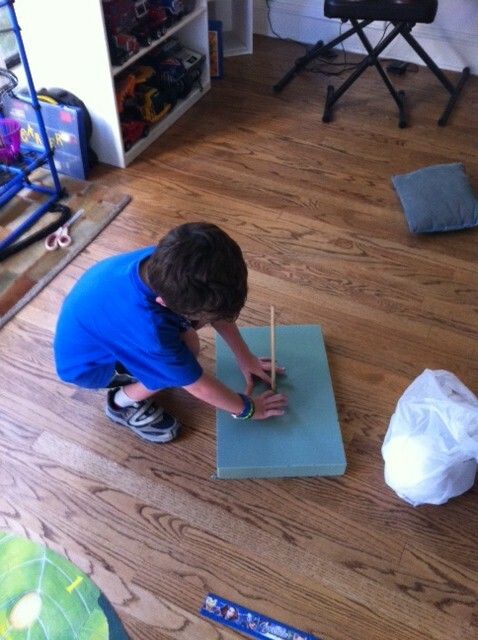 On Monday when he got home from school all he wanted to do was finish the project. In fact, he started crying because he didn’t want to take piano lessons since he wanted to work on science fair “Mom, all I wa-a-ant to do is finish my so-o-lar s-s-system.” Tears streaming down his face. 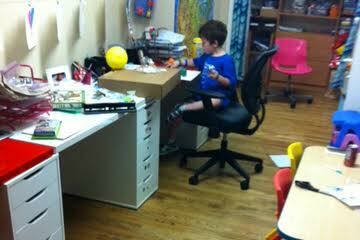 Henry (from Davis) got the idea to test paper airplanes. Together, they developed 10 prototypes – each named and numbered, and a series of experiments: how far, how many and type of tricks, flight time, and weight it could carry. He flew paper airplanes for three hours straight. Data collection. Of course, he still hasn’t formulated a hypothesis, but he did some great drawings in his journal of his process – little stick Henry on the balcony with a little triangle plane – distances marked where known. I couldn’t stop smiling all day. 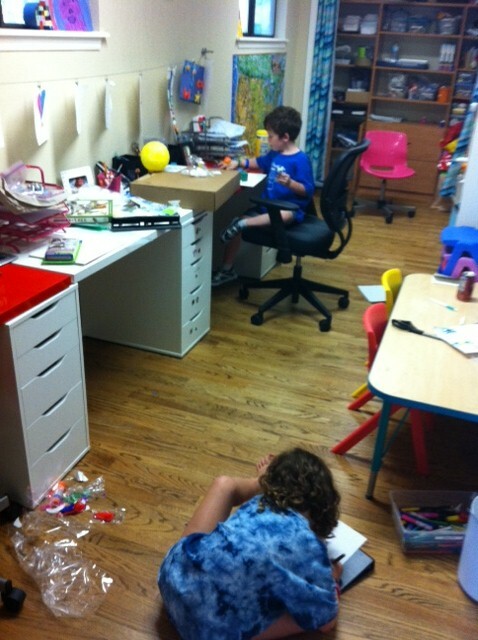 It was complete chaos – at one point I was whispering letters into Emmy’s ear for her resource list in her journal and turning to Carter and doing the same for his list (“P-A-P-E-R, Emmy and Carter B-A-L-L-S”. Davis and Henry went up and down the stairs in our house for hours – literally. It was a beautiful, organic, crazy day. I thought, you shouldn’t complain at all. You have a happy healthy family and a kid who wants to learn. Facilitating that may be annoying at times – we had tears, spent $50, and were exhausted just from Sunday – but the joy is infectious. Emmy has started bringing her book into class to show her friends. Some of the other kinder kids now want to do projects. Happiness, despair, excitement – so much comes from within. I learned from my cancer battle that attitude is a huge chunk of the fight. So at the Ward house, we go with happy.